International cuisine is not always about the strange and unusual but experiencing these dishes can take any foodie on a delectable trip through some wonderful taste combinations. One of the latest countries to be noticed for its cuisine is Fiji (Republic of Fiji) with its combination of European, Asian and Indian flavors. A former colony of the British Empire this group of islands is now part of the area known as Oceania. About 45% of the residents are of European descent and English is one of three official languages. The opportunities for shared food products between the US and Fiji is great. Add the importance of tourism in keeping the country’s economy going and food becomes a huge factor for exports to countries in Southeast Asia. Culturally, Fijians have a love of food similar to Americans. While considered healthier by some accounts for its natural ingredients of fish, root crops, coconut and fruits, the residents have gradually adopted a diet more based on snacks and desserts. Still observing morning and afternoon tea as it did when it was a British colony, Fijians enjoy foods which are higher in calories and more to the liking of the global palette. An expanding food vendor industry is popping up around night spots and busy city locations. These vendors offer many native foods. 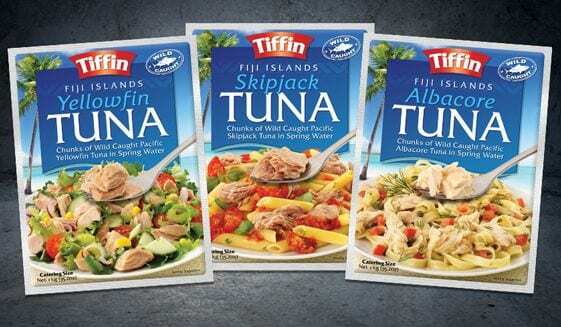 Being well industrialized, Fiji also has a booming food production industry that offers prepackaged foods to many countries within the Pacific Island region. Here are what might be consider the Ultimate Guide of Snacks in Fiji. Regrettably finding an online grocery outlet for these items is difficult but a few of these items are found in larger metropolitan areas and within smaller outlets specializing in Asian food items. A tradition left over from British Rule, afternoon tea is a wonderful opportunity to have a light snack and enjoy time with a friend. A typical tea menu in a local shop might consist of fresh baked scones with cream and jam, small cucumber sandwiches and a rich brownie to enjoy as dessert. Tea or coffee is the beverage of choice in this case. Similar to large shrimp, these prawns are a a local catch and deep fried with a specialized coconut coating. Served with a sweet chili sauce that speaks to the Indian and Thai influences in the region. Flatbreads from native origins are joined together with multiple dishes of sauces, spicy pastes and chutneys. A bit of research into Fiji recipes and you soon find that sauces are abundant and used to flavor all kinds of dishes. Sauces are created with broths and fruit juices as well as spices for a unique flavor. Chutneys are created from the mango, passion fruit and other island fruits with lime and spices that blend sweet and spice together. Pastes are based in dried lentils (beans and peas). Often added like a sandwich spread or mustard, the flavors can be mild or strong. Known by the British and Australian word for cookie, biscuits are a staple in a Fiji household. Several companies mass produce biscuits and products for different uses and tastes. These are but a few that enjoy popularity on the islands. Specially marketed for use during morning tea, these crackers are intended to have a flavor that is distinct to the Pacific Islands and surrounding areas. The FMF brand guards its list of ingredients and recipe as a proprietary secret and claims it has never been duplicated. A shortbread style item, it makes a tasty start to the day and is popular enough to find its way to larger international food stores in the US. This packaged combination between a cracker and a bread stick has a savory flavor with cumin seeds sprinkled on top. As a wonderful addition to a bowl of soup or salad, they can also serve the diner well as a base for the many foodservice style fish and chicken salads. This simple item is a prime example of the Indian influence Fiji. Available in flavors - Original, Coconut, Mint and Orange - this simple hard cookie is island flavored and has been dipped in rich chocolate as an added bonus. Available in variety packages and original, this classic biscuit is available plain. Either way, the choice is great for afternoon tea or at the end of a lunch time meal. Offered in a larger package than most other types of biscuits, these are a collection of various sandwich cookies. Flavors such as lemon, vanilla, coconut, orange and chocolate highlight the cookies while the creme centers are rich and generous. 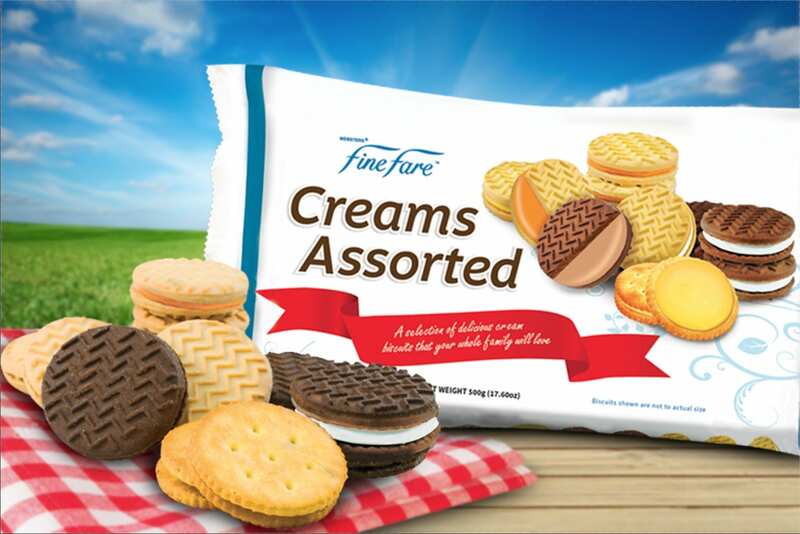 If your sweet tooth runs more to the plain rather than the cream filled, the Fine Fare Family Assortment of biscuits and cookies might be a choice. About 8 different types of cookies (imprinted shortbread, coconut singles, and a oreo-lookalike sandwich version) are packages together. Larger packages are on shelves for customers. Mixing the sweet taste of Lemon cream and the salty taste of a savory crackers, these lemon bits are served in small bags just right for snacking. Logically, many of the breads and small cakes are fruit based. These small moist cakes are called puddings after the English tradition. Bake shops in Fiji do use the term cupcake or muffin as well to describe these delicious and rich favorites. If there is no time for home baked goodies, these packaged goods come from Australia. With an ingredient base of 36% dried and natural fruits, this type of fruit cake may not be the same as ones in the US. Big Sister Puddings come as rich and moist cakes in Golden, Rich and Light varieties. Often found in bakeries by the slice, banana breads are sold in many forms. Banana scones (something of a triangular biscuit) are also a favorite. Chips and munchy mixes have quickly risen in popularity. Based on wheat as well as corn and rice flours, the flavors are often savory such as Chicken, Onion, and Cheese. Here are some of the most common choices seen in stores. 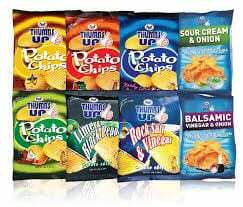 Using potatoes imported from New Zealand, these popular chips come in snack and family size bags. Several savory flavors seem to be available: Ready Salted, Chilly Garlic, Hot & Spicy, Chicken, Sour Cream & Onion, Balsamic Vinegare & Onion. 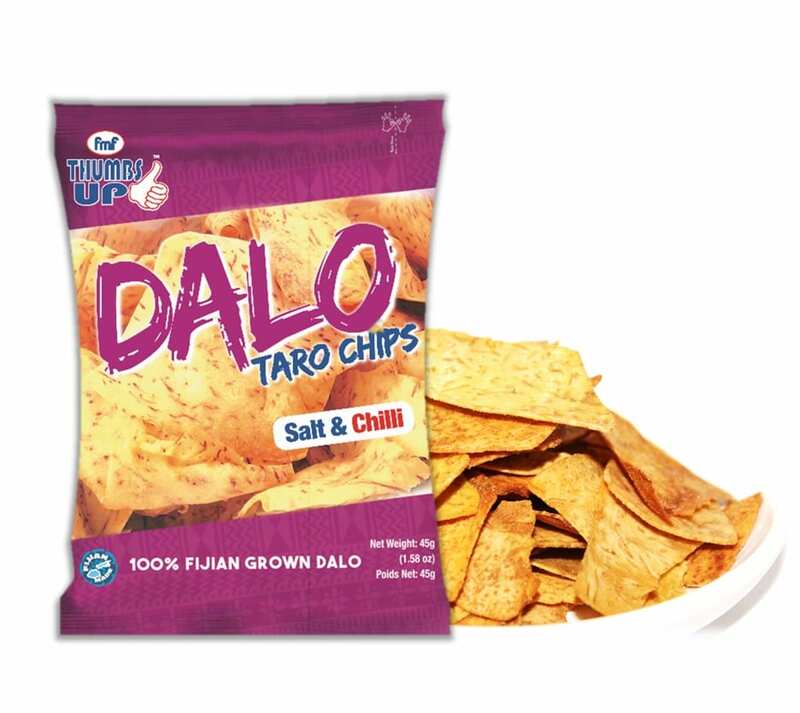 Considered a truly Fijian food, these chips are made from locally grown Taro roots and seasoned with traditional salt and chili seasonings. Available in snack size and family size bags, they may be a bit harder to find in the US but should be tried if the opportunity to travel to Fiji presents itself. According to Goodman Fielder, these corn and rice flour based snacks rank right there at the top for popularity in Fiji. A native product, they come in four flavors such a Extra Cheese, Chicken and Cheese, Cheese and Onion and Pizza. Packaged in four different sizes from snack to family size, the product is exported to approximately 10 countries throughout the Pacific Islands. There is no modern part of the world that does not have some type of Pizza and Fiji is no different. But walking up to the counter and ordering a Pepperoni to go, might be a bit harder than in downtown Los Angeles. As one visitor stated in a review, the flavors might be “confusing”. Not to be confused with the Alamode, CA location, Tucker’s brand ice cream is made in Fiji and is available throughout Southeast Asia. Like similar brands in the US, they offer bulk containers for use in restaurants and take home containers in a variety of flavors such as passion fruit, chocolate, orange, Blitz and strawberry. The company also produces a line of a dozen or ice cream bars in single serving packages. Chocolate Attack, Blitz and Pacific Split are just a few of the varieties. In 2016, it released a Choc-a-Nana and Licorice flavored ice cream. Exporting to 10 countries, Tucker’s Ice Cream is known as a popular brand for frozen type snacks. Chicken and canned fish are often sold in stores. Snack packs with or without dressings are found and make a quick lunch when placed on a bed of greens or served with the many types of flatbread and crackers available. Here are a few choices. Shredded cooked chicken is paired with one of three flavored mayonnaise dressings and is available at foodservice outlets. While original is a fall back, a spicy Tikka Masala version and Coconut mayonnaise version offers a distinct island taste. Tuna only found in Pacific waters is a specialty of this company that provides foil, ready to eat, packs of Albacore, Yellowfin and Wahoo tuna. Serve on a roll, flatbread or with crackers. Regardless of the country of origin, it always seems there is a candy or sweet confection that satisfies the sweet tooth. Interestingly, local favorites include some well known brands. Native to Australia and imported from there, Cadbury Chocolates offer many kinds of candy to the island. The company produces a wide variety of chocolate and jelly styles candies that are far too numerous to mention here. The Dairy Milk signature brand is available in Rocky Road, Fruit and Nut, Hazelnut, Turkish Delight and other variations. And yes, the well-known Easter Eggs make an appearance in the islands as well. Manufactured and sold in packages of 12 or 15 pieces, this fudge like confection is Indian in origin and unlike anything stateside. Flavors come from spices and the addition of beans and nuts. Varieties such as White, Yellow, Coffee, Almond and Coconut keep the standard Chocolate company. 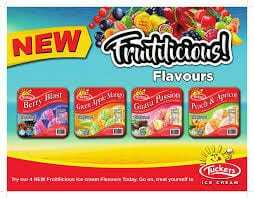 Coming from imported and local providers, these brands of fruit flavored hard candy are infused with a sweet jelly like center. One favorite brand is Damia. Taking caramel candy to a new level, these soft caramel ‘eclairs’ have a creme filling in vanilla. This sweet and chewy favorite has become popular and is available online. Food without a good beverage is a bit of an anti-climatic experience. From the popular Fiji brand of bottled water to its locally identified juices and alcoholic choices, beverages round out our snack section with many different options. Bottled on the islands and exported to many other countries, this brand of water is known for its soft flavor. It is available in most places on the island and is readily available in the States as well. Produced in Australia and available in several flavors, these bottled juices are a Fiji favorite. Flavors include Orange, Breakfast Blend, Apple & Pineapple and Apricot. A wide range of carbonated beverages is produced and imported to Fiji. Coke and Pepsi products are readily available. One interesting choice that pops up in searches is an Orange/Mango flavored Schweppes Ginger Ale. Manufactured by Pacific Beverage Limited (a Coca-Cola company), this lager style beer is a European influenced beverage and not always readily accepted by tourists. Its strong flavor is a local favorite. Another product produced by Pacific Beverage Ltd., this locally sourced rum and its variations finds its way into any number of mixed drinks and local blends. An award winning recipe, Bounty Rum is available throughout the Pacific Islands.